Over time, the loss of one or more natural teeth can negatively influence a patient’s life in various ways. They may struggle to eat their favorite foods properly, speak confidently with friends and family, and even smile in photos without worrying about their appearance. At Willow Run Dental Association, we highly recommend dental implants as a state-of-the-art solution to tooth loss that can virtually turn back the clock on what has been lost. 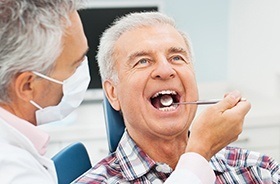 Not only will your new “teeth” look and feel virtually indistinguishable from the original structure, but many patients are able to enjoy them for a true lifetime without replacement or repair. 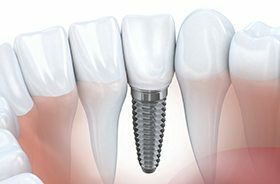 If you would like to explore the various benefits of dental implants further, contact our Auburn, ME dental office to schedule an initial consultation. Implant-retained dental crowns are highly recommended when restoring individual teeth/implants. Our dentists can anchor them between original teeth in a conservative fashion – their structures won’t have to be significantly altered to accommodate the new addition, as they would with a traditional bridge. The placed implant will support and preserve the jawbone’s continued health too. If the patient is missing multiple teeth that appeared next to one another, an implant-retained bridge can provide optimal coverage. Unlike traditional bridges, which required nearby healthy teeth to successfully anchor to, this more modern prosthetic is securely held in place through the continuing support of two implants. The implants are positioned on either side of the gap, providing a sturdy foundation that allows for full biting strength and prevents the gradual shifting of nearby teeth. 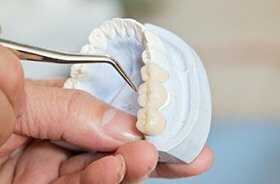 Contrary to popular belief, patients who have experienced extensive tooth loss may still be prime candidates for dental implants. Implant-retained dentures can be paired with a small number of strategic implants throughout the jaw for successful, cost-effective coverage. Depending on the patient’s oral health and specific preferences, this custom-made prosthetic can be permanently fixed in place over the implants or kept removable in nature for added convenience.